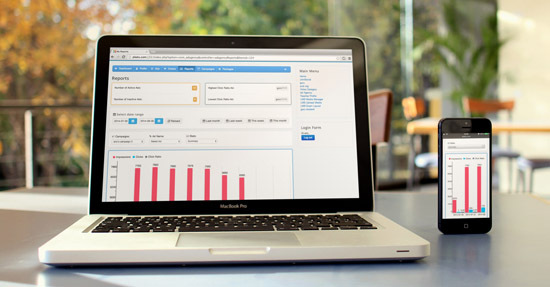 Reading your stats isn't just a vital part of Internet business. It should also be fun. You should enjoy seeing how much money you're making! We've completely revamped the reports, packing in detailed information that's easy to read and a pleasure to break down both for admins and for advertisers. Now that you can easily which advertisers are inactive, you can reach out to them and make them an offer they can't refuse. Bring them back as paying customers. See information on inactive campaigns, talk to the advertisers and help them to relaunch. See which ads have stopped running, and dream up incentives to get them moving again. A summary of where you were last month and where you are this one. Expect those figures to keep growing! Spot your best advertiser and make sure they keep promoting on your site and contributing to your revenue. See which ad won the highest CTR. Contact that advertiser, show them the stats and use their example to boost the click rates of other advertisers. Keeping your advertisers engaged will keep them coming back and paying for more advertising space. Talk to advertisers whose campaigns are failing and offer them some advice. Show them examples of the most successful campaigns and help them create their ads. They'll see a massive improvement and understand why you're worth paying. To see the details of any report just click the report's number or name. You'll have all the information you need to keep your advertisers happy — and paying. 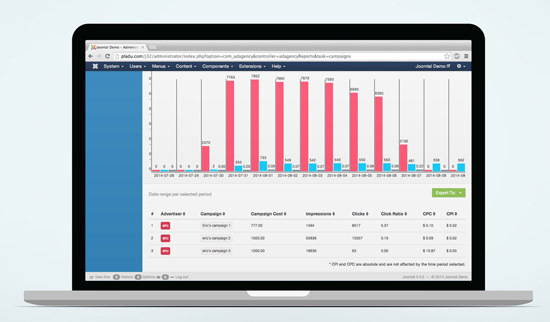 The Advertiser Interface provides detailed information about campaigns and active ads. All information is specific to the advertiser. See which ads are doing best; the number of impressions; the number of clicks generated; and even the click ratio. The campaigns view also shows CPI and CPC ad data. Data is presented in beautiful new graphs. Enjoy a birds-eye view of all an advertiser's campaigns and ads. Graphs can be adjusted to show a predefined period (Last Month, Last Week, This Week, This Month) or set to show a custom time period. Graphs also show impressions, clicks and click ratio. All the information you need about your advertisers is just a click away. Our designers have also upgraded Ad Agency to the latest Bootstrap 3. That makes for a fabulous design and our new reports take full advantage of it. Clear design equals easy and intuitive use. 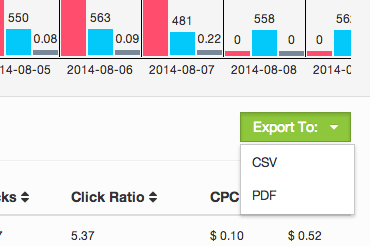 In addition to seeing those reports in beautiful graphs, Ad Agency now lets publishers and advertisers export all data as PDF or CSV files. 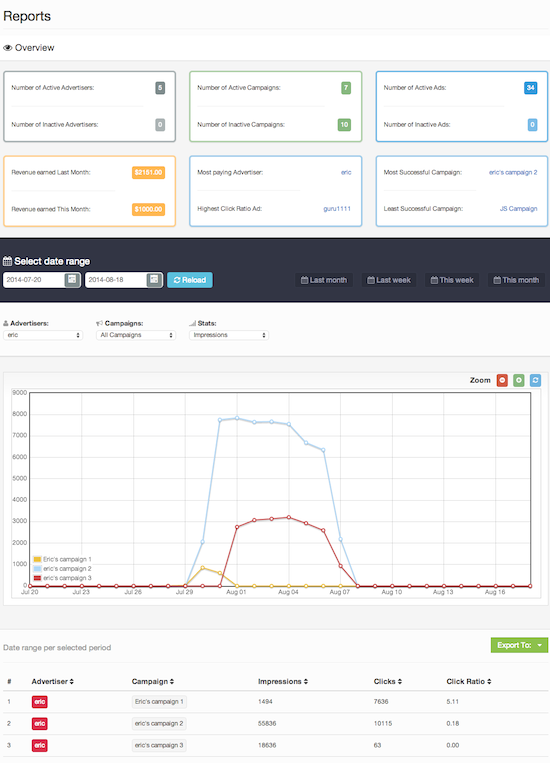 Exported data comes from the tables below the graphs on Overview, Advertisers and Campaign pages.